Quarterback Matt Ryan (4,515 yards, 26 TDs) and Roddy White are the stabilizing forces to a Falcons club that could undergo big changes this offseason. ATLANTA — On Monday, Falcons owner Arthur Blank said if the team does not have a winning season and make the playoffs in 2014, the organization will make "additional changes." Presumably, he was talking a little higher up the chain of command than another offensive line coach, as the Falcons currently are looking to hire their third in four seasons. While Blank cited traits that pertain to the NFL’s most successful franchises in recent seasons — New England, Pittsburgh, Baltimore, New Orleans and Green Bay — as being the length of tenure by the same owner and same coach, one could foresee a scenario in which head coach Mike Smith needs to meet Blank’s criteria next season, in order to return in 2015. "Well, I would certainly say a playoff season and a winning season," Blank said. "I would say this and I think this is important for our fans to understand is that I’ve made this quite public in the past: My goal as the owner, the steward, the conduit for the fans is to put rings on the fingers of our players for Atlanta … and that has not changed. "And if I felt for any version of a New York minute that we didn’t have the right leadership and ability, capability in that building to make that happen in 2014, we would make additional changes. I don’t think those changes are necessary because I think we do have ability in the building, but that goal and that desire is my standard. 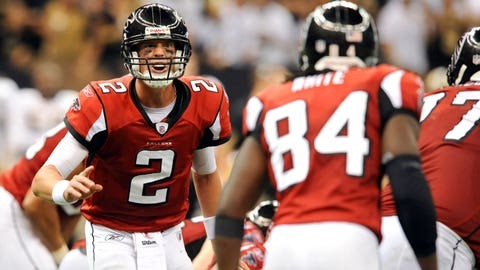 "It’s not the standard of a ‘B’ … it’s the standard of an ‘A.’"
The quest to turn around the Falcons with Smith and general manager Thomas Dimitroff, each of whom joined the Falcons in 2008, could be abetted by the possibility the league might add another wild-card playoff team to each conference next season. Nonetheless, the Falcons have to find a way to go from 4-12 back to the form they showed in four of Smith and Dimitroffâs first five seasons when the Falcons qualified for the playoffs. To that end, the owner wants to see his team get tougher. One week earlier, Smith was asked if his team was nasty enough, as the Falcons finished last in the NFL in rushing yards and $100 million quarterback Matt Ryan took a beating, getting sacked 44 times. The coach hedged to a degree, noting all NFL players are tough. He then said the Falcons must do a better job winning the line of scrimmage on both offense and defense. Blank went one step farther on Monday. "It doesn’t mean we want players that are going to end up different sections of the newspaper other than the sports section, but I think we do want players that have a capacity to be tough, as tough as they need to be, to play right up to the line, to the edge of the line and with coaches that are prepared to coach them that way, too." Blank said the Falcons need to find positional coaches along the line that reflect Smith’s intensity. He also added the club will revert more to the philosophy that Smith brought with him to start his tenure — controlling the clock and running the football on offense. "Any time you make coaching changes, it’s of concern," Blank said of the numerous offensive line coaches. " … I would say it’s not something we want to be writing home about, saying, ‘Hey, we had a great achievement.’ I think it’s an area of concern. "I think Smitty is very concerned about it. I think (offensive coordinator) Dirk Koetter is very concerned about it. I think we’re looking for a quote ‘final solution’ in terms of an offensive line coach at this point. We’ve got some great candidates." Potential candidates include former Minnesota head coach Mike Tice and former Tennessee Titans head coach Mike Munchak, a Hall of Fame lineman and longtime line coach with that organization, although Munchak reportedly is a candidate for the vacant position at Penn State, his alma mater. Another possibility is former Titans offensive line coach Bruce Matthews, also a Hall of Famer. Matthews’ son, Jake, is an offensive lineman at Texas A&M and a potential candidate for the Falcons to draft at No. 6 overall, as they attempt to fix their line issues. In terms of what kind of player the Falcons would take, Blank said they would not take a skill position player. It’s all part of the aftermath of a season in which Blank characterized the team’s disappointment as "severe." He does not expect that kind of disappointment again in 2014, saying he has "every reason to believe we’ll go from last to first in 2014." If the Falcons do not, well, big changes could be in store this time next year.